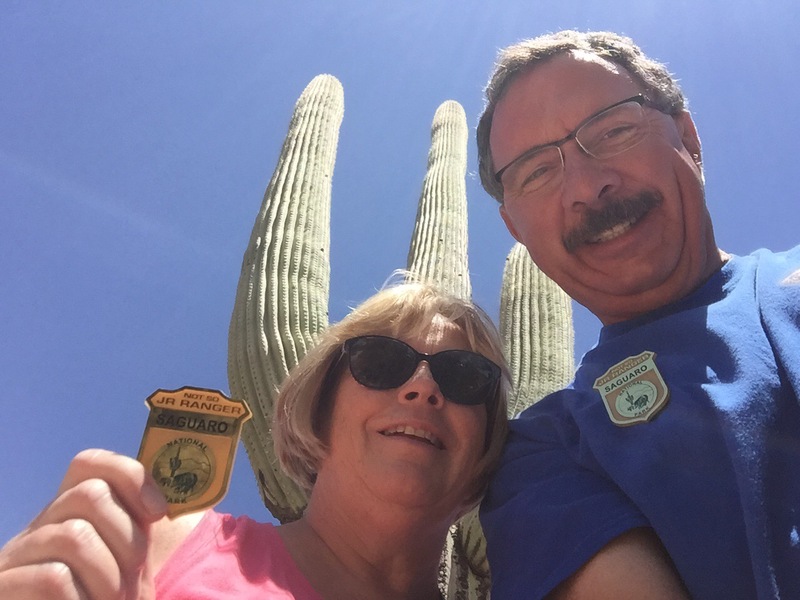 After leaving Tucson, we made a quick hop over to Ajo, Arizona to see Organ Pipe National Monument. Seeing that this was one of our shorter travel days at 136 miles, we thought we would do a little exploring after we set up camp. As we started to drive away from our campsite, the tire pressure warning indicator came on in the Escape. Well, Ajo isn’t exactly a booming metropolis, so we asked the campground owner where we could find a tire store. They suggested the used tire shop down the street. The business consisted of a well worn building filled with old equipment and a bevy of used tires. It was run by an older Hispanic gentleman and his wife, who happened to be eating their lunch at a combination desk/kitchen table/parts counter. I immediately could sense that this guy had been here for years and knew his stuff. 😉. He jacked the car up, took the wheel off and proceeded to dunk it in an old claw foot bathtub filled with dirty water. It didn’t take long before he found the leak, which actually was from a failed patch that we had done in Kentucky. He explained that it was too close to the sidewall and would never hold long term, so I had him plug it and went off looking for a new tire. There was a Napa parts store close by and he explained to me that the closest tire dealers were in Phoenix. After a few phone calls, I located an identical Goodyear SR/A at a Goodyear store in Goodyear, Arizona, of all places. So off we went on an 80 mile journey to Goodyear. After paying for the tire, I couldn’t help but ask Nile the store manager if there was a connection between the town’s name and the tire company. 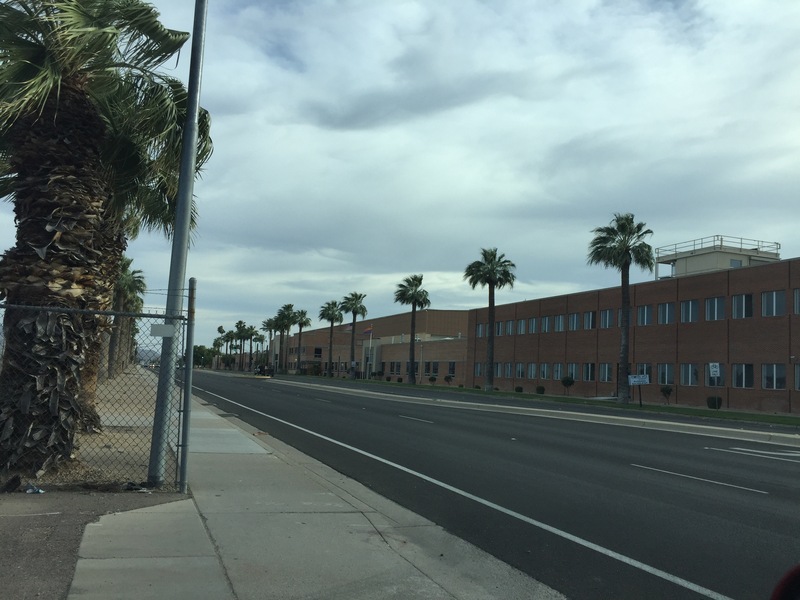 He explained that the city was named after the business, and that the store we were standing in was one of the first Goodyear tire stores. He showed us an old photograph on the wall of the building in its early years, which looked like not much more than a 1920’s era gas station. 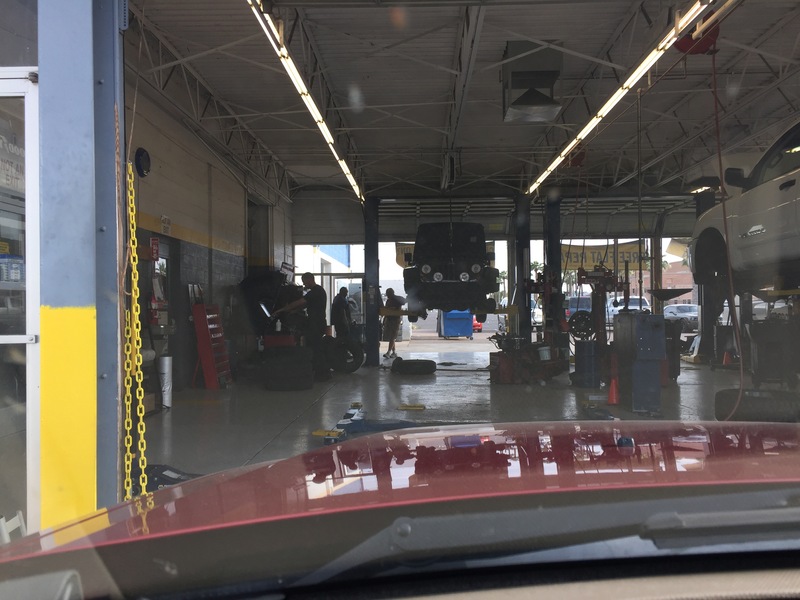 Over time, it had morphed into the full service auto center it is today. Back in 1916, Goodyear purchased a large amount of land in the area to grow cotton, which was used in tires back in those days. 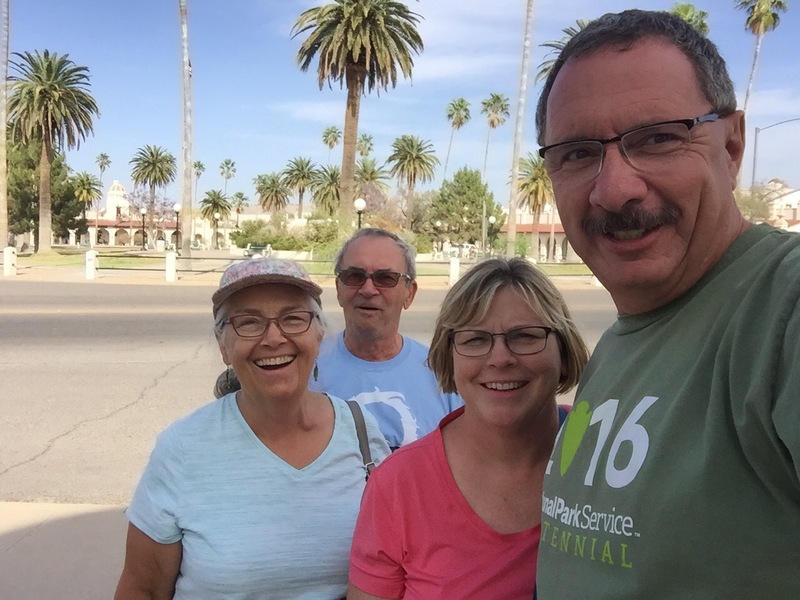 The next day, our friends Jeanne and Keith drove down from Mesa, so we could explore Organ Pipe National Monument together. We met them at the 2014 Fall RV Dreams Rally and had lunch with them last April in Junction, TX. It was great to see them again! Our first stop was at the Kris Eggle Visitors Center. 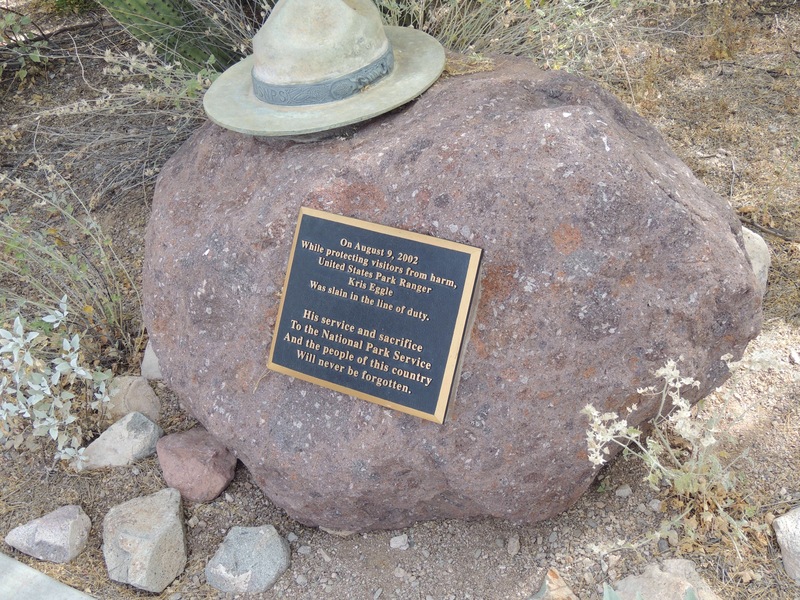 It was named for National Park Ranger Kris Eggle, who was killed in a shootout in the park with Mexican drug smugglers in 2002. Kris was a Cadillac, Michigan native, and was previously a ranger at Sleeping Bear Dunes. Stocked up on information, we set out to explore the park. We chose the 21 mile Ajo Mountain Drive as our first trip of the day. 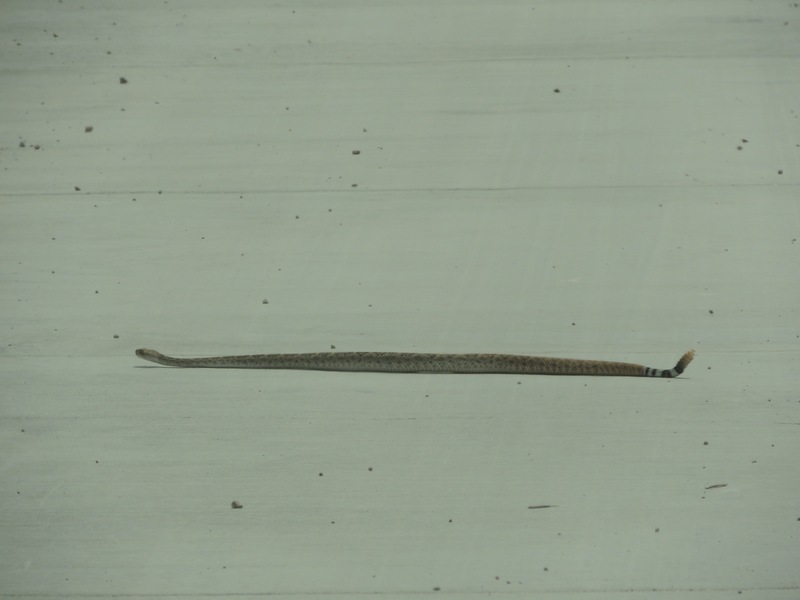 …and our second Western Diamodback rattlesnake of the trip! 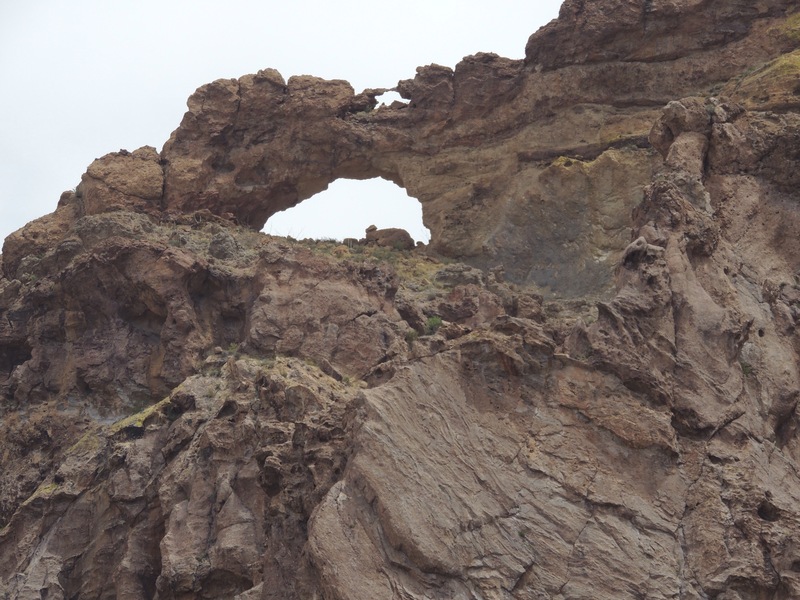 This double arch was perched high up on a mountain ridge. 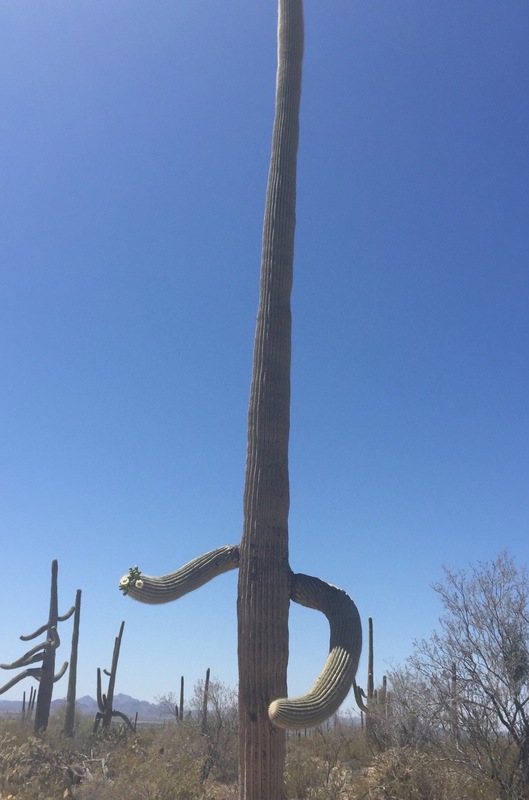 This unique Saguaro caught our eye also. The blooms were close enough to get a good look at. Amazingly, a bee had descended into this bloom as I prepared to take this photo. It completely disappeared into the flower! 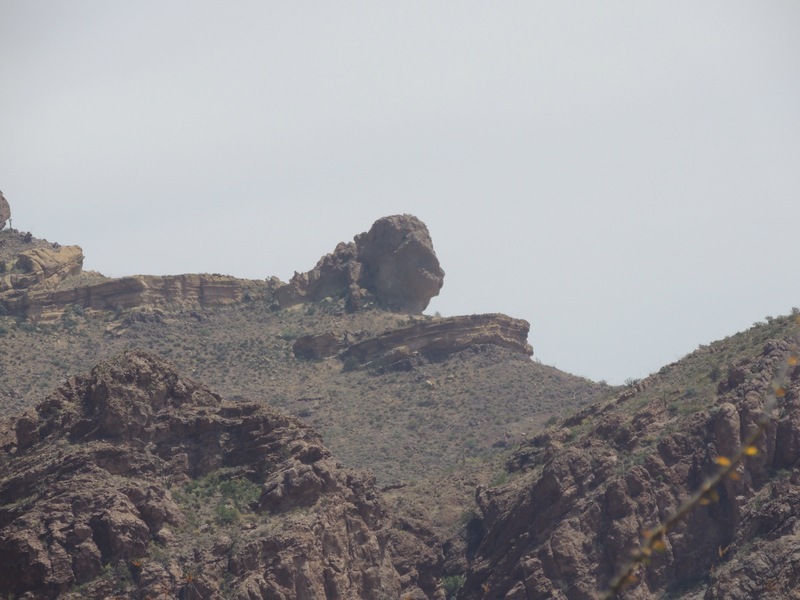 Along the way, we saw this unusual outcropping. What does it remind you of? 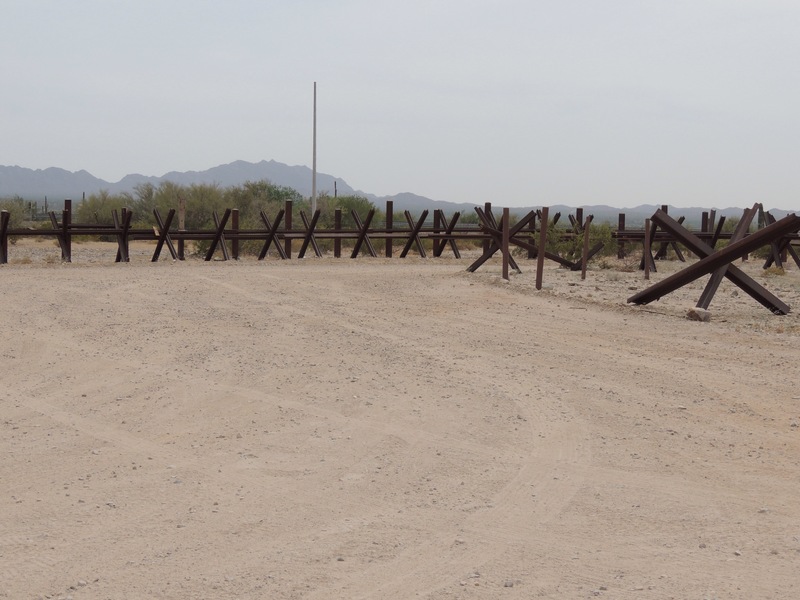 After the Ajo Mountain Drive, we decided to go down and take a look at the border. Wow. This was not the friendly border we had experienced in Big Bend last year. 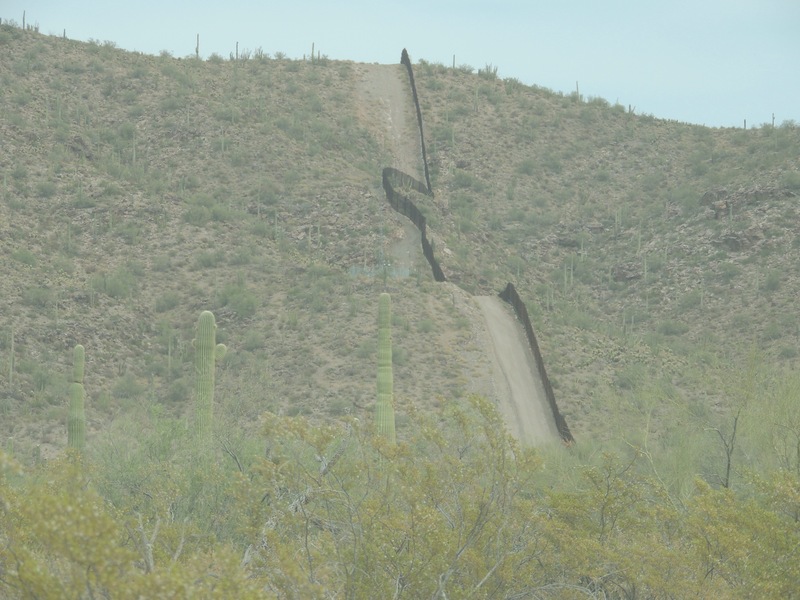 At a few points, the border fence snaked up the hillsides. After driving a few miles along it, we decided we had seen enough. We headed back to Ajo to check out a little more of the town. 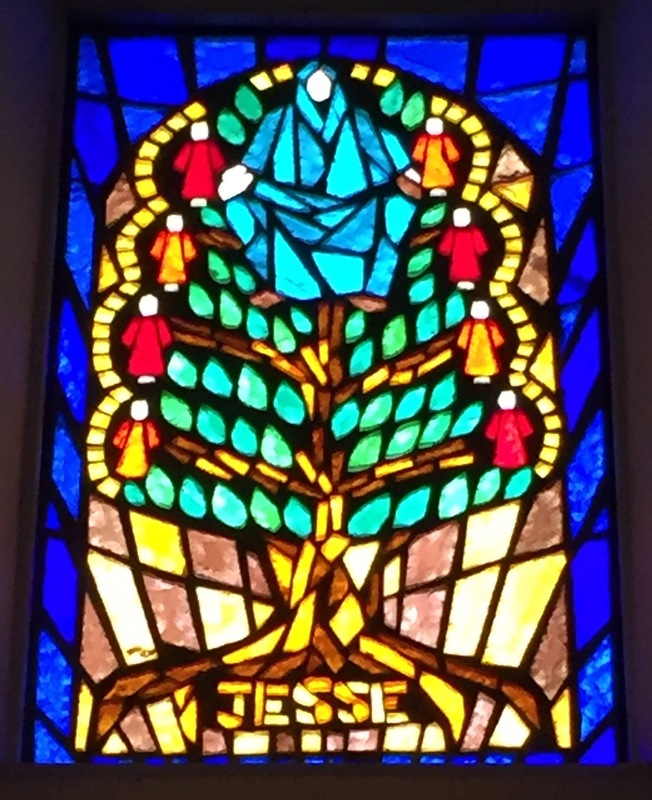 We toured the Immaculate Conception Church, with its colorful stained glass. We also visited the town plaza, although most of the businesses surrounding it were empty. That didn’t matter, as we had a great day with Keith and Jeanne! Next up: California. Stay tuned to see what we discovered! How to ride the blimp and also search our Amazon link here! We were concerned that we were going to arrive in Tucson too late for any hiking or meetups, as it was getting too hot, the snakes were out, and all of our blogging buddies had headed north. After we set up at Mission View RV Resort, I decided to see what was happening online. I noticed that Steve and Mona Liza from Lowe’s RV Adventures had posted that they were still in town, even though they were supposed to have moved on. Although we had followed their blog for years, we had yet to meet them. Well it turns out that Steve found out he had cancer that required surgery. We contacted Mona Liza and said we would like to meet them, if they were up to it. I explained that I was a 7 year cancer survivor, and was doing well. She replied that Steve was in the hospital recovering from his surgery, but she would love to meet us. We set up a time to meet for dinner the next night. The next morning, we were up early to try to beat the heat. 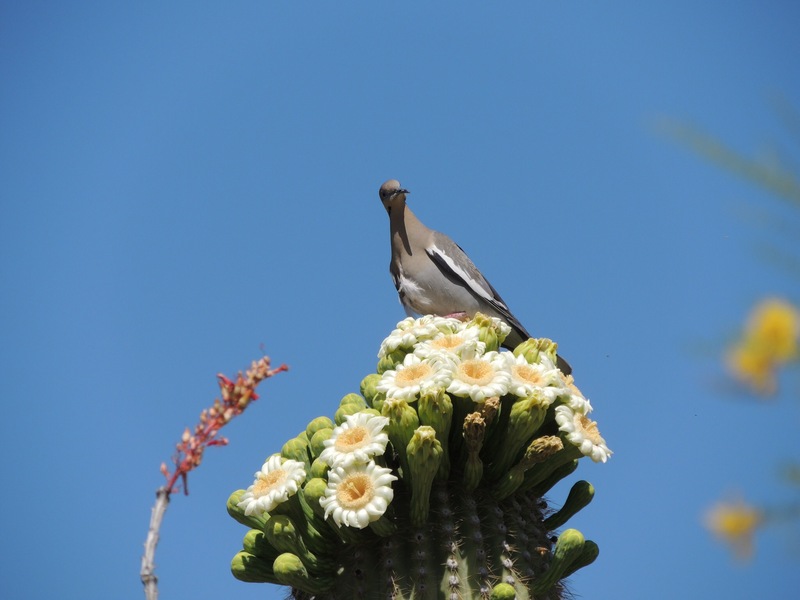 Our destination was the Arizona-Sonora Desert Museum. This facility is a combination of zoo, botanical garden, art museum, aquarium, and aviary. 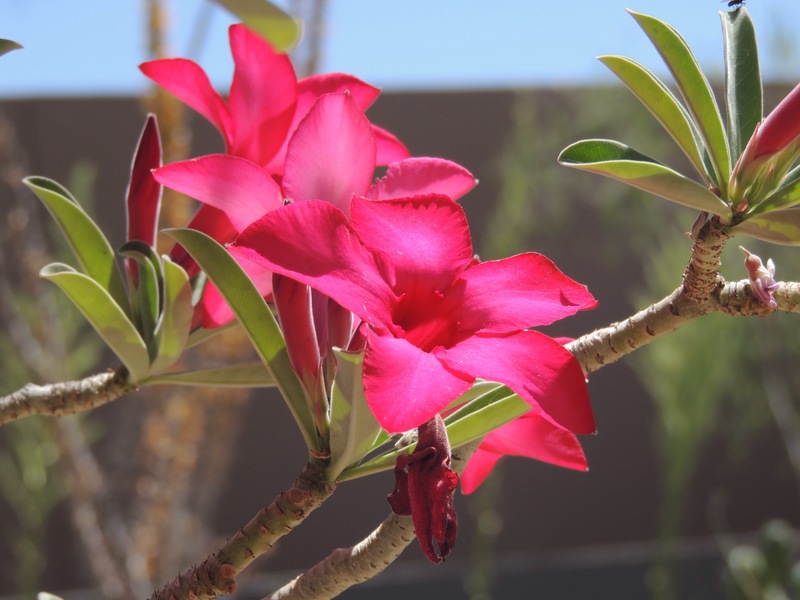 It was recommended to us by several people, and we figured it would be a good introduction for us to the unique Sonoran Desert. While we aren’t on board with caging otherwise healthy mammals, we thought the other aspects of the museum were well done and helpful. The desert blooms were absolutely beautiful. 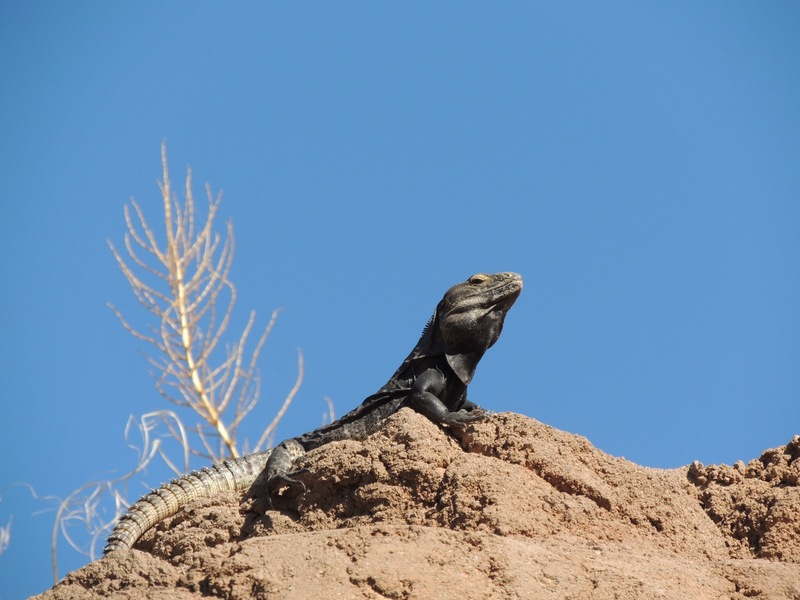 This spinytail iguana kept watch over the surroundings. 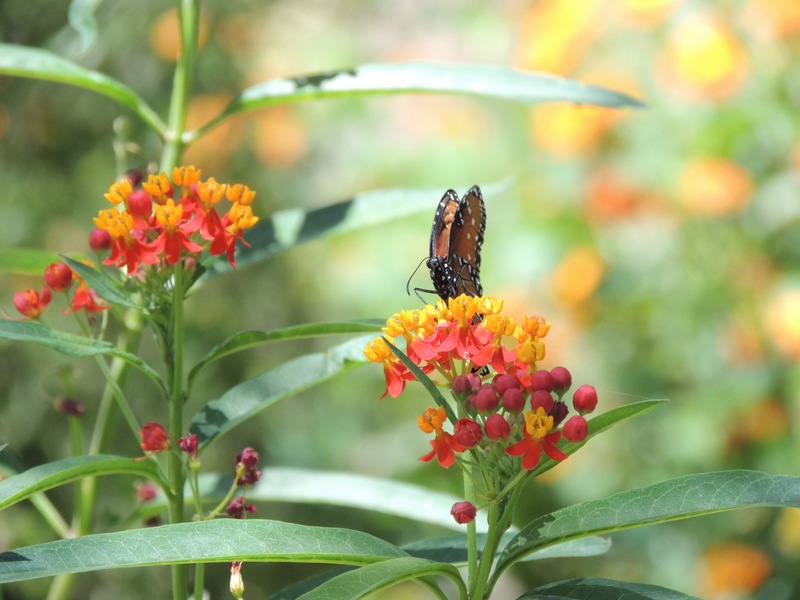 The butterflies were enjoying the spring blooms. The museum had a great hummingbird aviary. 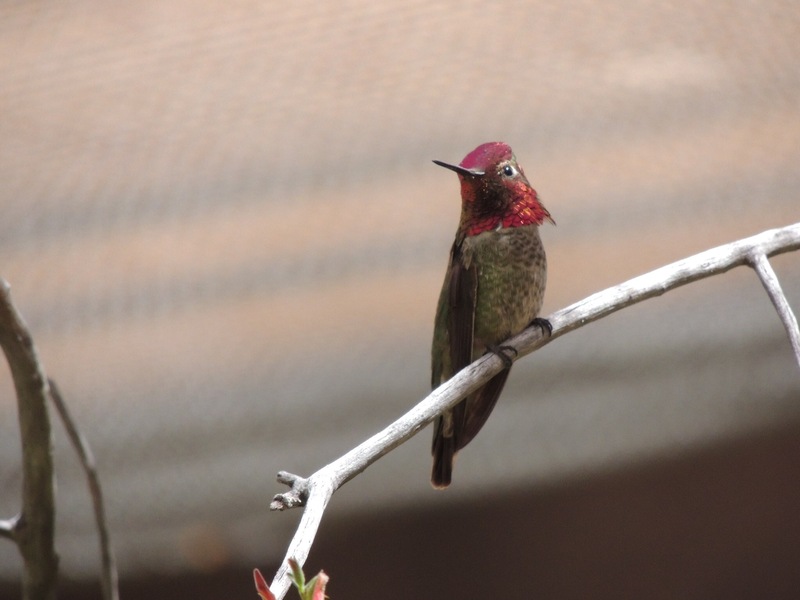 This is a species called Anna’s Hummingbird. 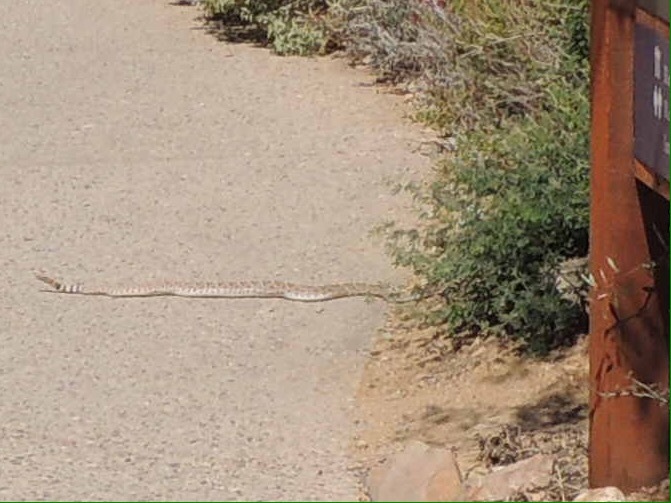 And just to prove this was more than just a zoo, a Western Diamondback rattlesnake slithered across a very busy pathway in front of us! 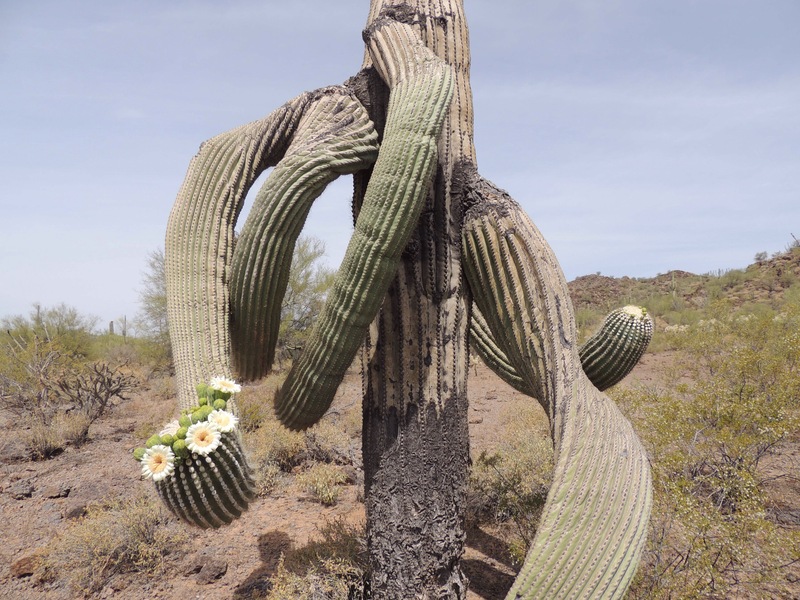 One thing we learned after getting to the Sonoran desert was that the Saguaro cactus normally bloom in May. 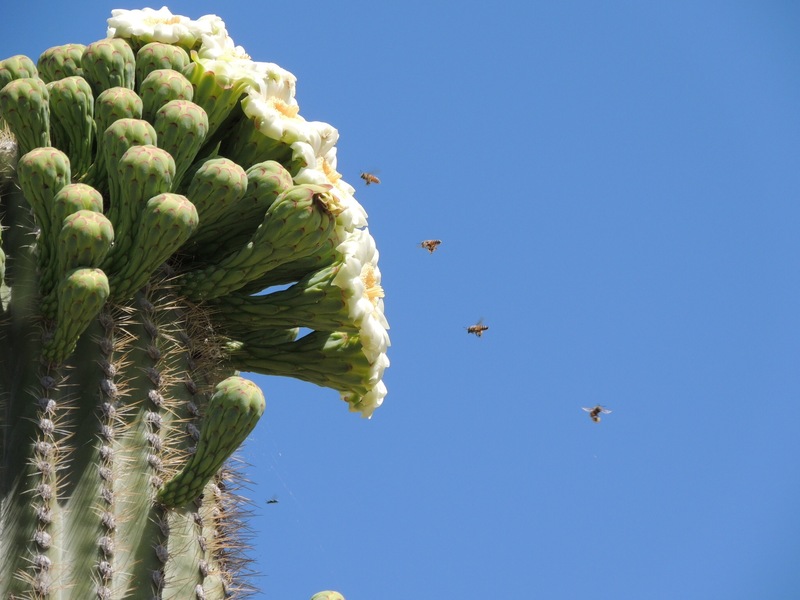 Most winter RVers miss this, as they typically move north before the cactus show their flowers. As luck would have it for us, the blooms appeared early this year! The bees were hard at work pollenating them. Each individual bloom is open less than 24 hours before it closes to begin the process of becoming fruit. Even the doves enjoyed a soft place to land! After we finished at the museum, we went to Saguaro National Park West. We picked up our Not-So-Junior Ranger book so we could learn more about the park. Seeing that this park has an east and west unit, we saved the bulk of the exploration for our trip to the east unit the next day. 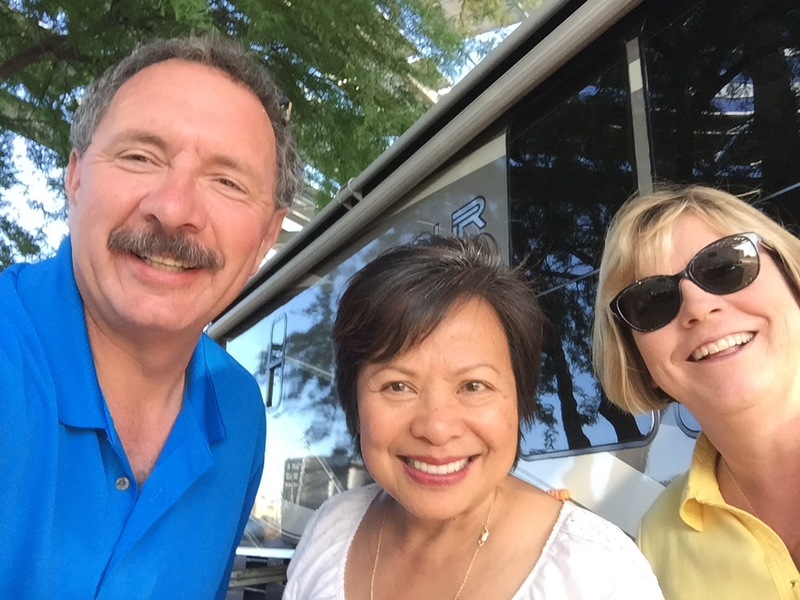 We headed back to Tucson and met up with Mona Liza. What a fun and energetic person to spend an evening with! We went to dinner with her at a funky little outdoor restaurant called La Cocina. 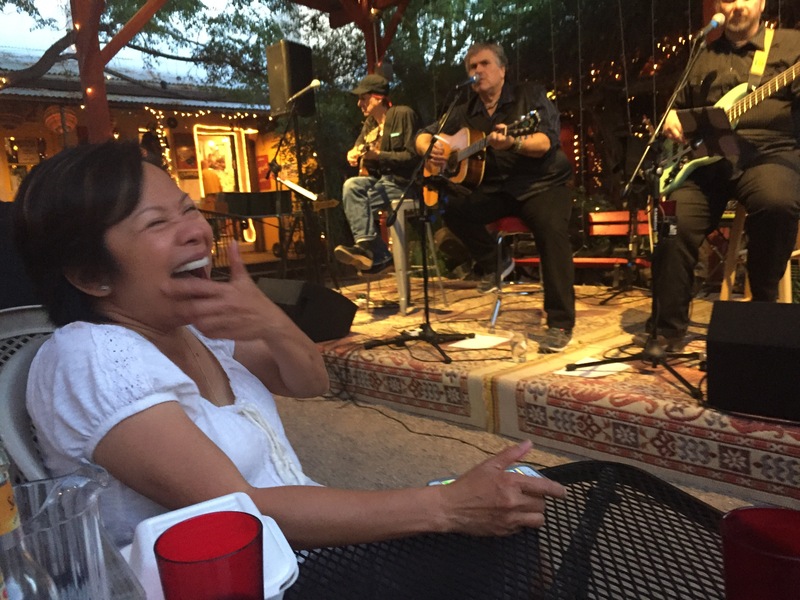 She cracked up after she caught me trying to take a photo of her listening to the band. We had a great time, and it was good for all of us to get together and talk. Here’s hoping Steve’s recovery will go smoothly and we will all enjoy a meet up in the future. 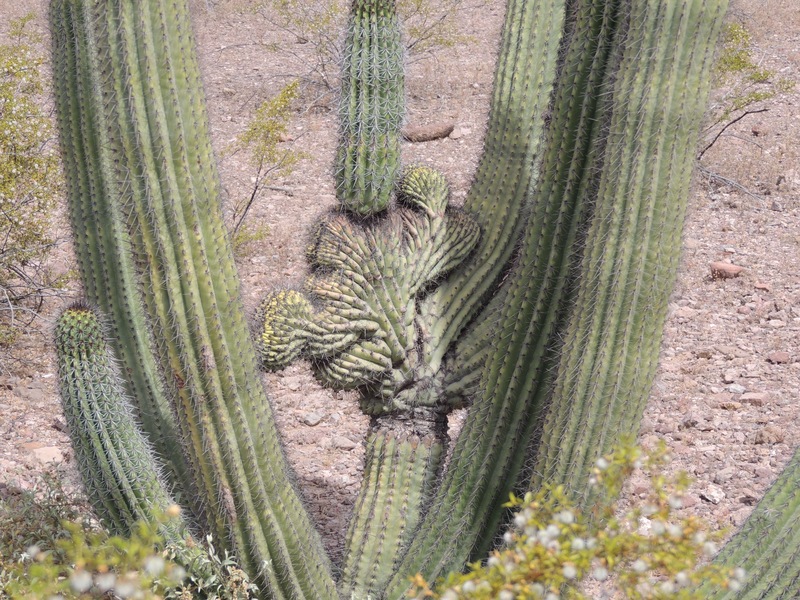 The next day, we checked out Saguaro National Park East. 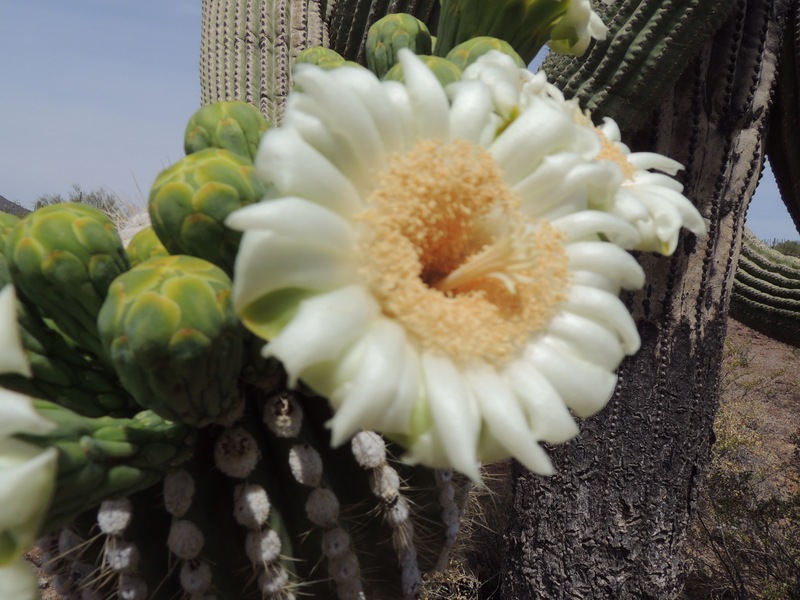 We took the 8.3 mile Cactus Forest Loop Drive into the foothills of the Rincon Mountains. And check it out…we became Not-So Junior Rangers! Thanks to Gaelyn at Geogypsy for tipping us off to this great program. It makes exploring the parks that much more fun! Next up, we head to Ajo! Stay tuned for that adventure!